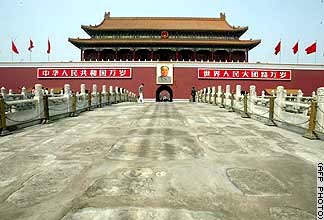 Tiananmen Square in downtown Beijing, a city of 14 million residents, is eerily silent as the SARS coronavirus has provoked the government to close down all public entertainment venues, forced thousands into quarantine while thousands more are staying in their homes or have left the city in fear of contracting the deadly disease. Photograph © 2003 by AFP. April 29, 2003 Beijing, China - On this date, China announced nine new deaths from severe acute respiratory syndrome known as SARS and 202 new cases, bringing the country's death toll to 148 and case number to 3,303. Some medical authorities have expressed concern that given China's deliberate efforts to hide SARS patients and even deny their was a disease problem until only recently, the actual number of cases might be double or triple the current publicly reported number. The World Health Organization's advisory against nonessential travel to Beijing and China's Shanxi Province, Guangdong Province and Hong Kong remains in effect where SARS is still a serious epidemic. There, as the government tries to clean buses, public buildings, schools and hospitals, the economies have collapsed in the face of a disease that is keeping thousands of people home, either in quarantine or in fear of catching the dangerous illness.